American will get what it wants now — big reductions in costs and flexibility on scheduling and routes — in exchange for giving up a chunk of the company to a group of its most dedicated employees. American Airlines’ pilots are being asked to give up a lot to help the bankrupt carrier get back on its feet. But in return, the pilots could end up with a chunk of the restructured airline worth close to $1 billion, industry analysts estimate. AMR Corp., American’s parent company, has offered the Allied Pilots Association a 13.5 percent equity stake in the carrier when it emerges from bankruptcy. The pilots will begin voting Wednesday on the tentative agreement, which includes the equity offer. 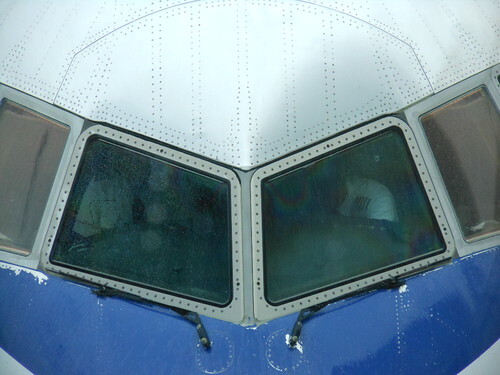 The cockpit of an American Airlines plane. Photo by Michael Coghlan. While it has become common for pilots unions to receive stock in a restructured airline after bankruptcy, none have been compensated with as large a stake as 13.5 percent, said Bill Swelbar, airline researcher with the Massachusetts Institute of Technology. “It is quite extraordinary what the pilots and the company agreed to,” Swelbar said. Pilots unions tend to carry some clout in bankruptcy court. Without pilots, an airline can’t operate its aircraft, which is why in previous bankruptcies, airlines have reached new contracts with pilots unions before emerging from court protection. In American’s case, the large equity stake was likely offered to the pilots with “the blessing of its non-labor creditors (bondholders),” wrote Wolfe Trahan analyst Hunter Keay in a research note last month. The Transport Workers Union, which represents American’s mechanics, store clerks and fleet service workers, is also negotiating an equity stake in the new American. But it’s unlikely it will receive as large a portion. The Association of Professional Flight Attendants was offered a 3 percent equity stake in the company’s last offer. In other cases, non-pilot workers have not received significant equity stakes, instead negotiating to keep other work or pension benefits. It is unclear how much the new American will be worth if it emerges from bankruptcy as a stand-alone carrier. Bob Herbst, founder of AirlineFinancials.com, estimates that the market capitalization of a post-bankruptcy American could range between $5 billion and $7 billion. That means a 13.5 percent pilot stake could be worth between $675 million and $945 million . “The pilots have given up the most in terms of pension amounts and have lost the most in terms of wage rates,” Herbst said, adding that the changes American is asking for in its pilots scope clause could impact pilot earnings for years. If the American pilots approve the contract with the equity stake, the union would likely divest and monetize it shortly after the company emerges from bankruptcy, industry analysts say. “Equity stakes are largely a matter of timing,” said Ken Malek, managing director at Conway MacKenzie, a financial turnaround and crisis management firm, adding that employee groups usually don’t remain shareholders for long. When United entered bankruptcy in 2002, the employees’ stock was wiped out as part of the restructuring. But when the carrier finally reached a tentative agreement with its pilots in 2005, the contract included a commitment to pay the pilots $550 million in convertible notes upon exiting bankruptcy, if its pension plan was terminated. In some cases, pilots have received equity even when the company has not entered bankruptcy. In 2011, Frontier Airlines pilots approved a contract that included concessions in exchange for an unspecified equity stake. In a Securities and Exchange Commission filing made this year, the equity stake was valued at $7.2 million, which vests over the term of the contract. Pilots at Delta Air Lines and the former Northwest Airlines each received claims during the carriers’ separate bankruptcy proceedings. But when the two companies merged in 2008, Delta pilots received a 3.5 percent equity stake in the new carrier while Northwest pilots received a 2.38 percent equity stake. As American’s pilots consider approving or rejecting the tentative agreement, which asks for $315 million in annual concessions, union leaders have emphasized the importance of the equity stake. American’s offer to the pilots would reduce costs by 17 percent. In exchange to the equity stake and pay raises, American would get important contract changes to work rules that would allow for broader use of regional jets and ability to code-share with other domestic carriers. The union also released a lengthy question-and-answer document last week to help pilots understand what the union may or may not do with the equity stake. The APA said it does not know yet how it will distribute shares among its members or if it will sell the equity stake on the open market soon after American emerges from bankruptcy. And if American merges with another carrier, such as US Airways, the union would receive 13.5 percent of what is given to AMR shareholders in a merger deal. The union has supported a merger with US Airways and said a vote in favor of the tentative contract does not mean it has withdrawn its support. The union expects to announce the results of the contract vote Aug. 8. If the contract is not approved, the bankruptcy judge is scheduled to rule on AMR’s motion to reject its union contracts on Aug. 15. “The APA believes — like all other unsecured creditors — that equity is an appropriate form of compensation for the changes made to the pilots’ collective bargaining agreement,” the union said.